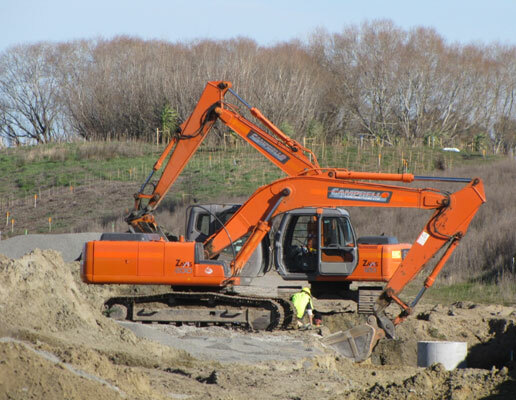 Sub-divisional Drainage, Farm Drainage, Civil Contracting, Digger Hire, Site Clearing, Auckland, NZ | Campbell Contractors Ltd.
Campbell Contractors was established in 1971 by Ron Campbell as a specialist subdivision construction company. Ron’s key skills enabled the company to take on a variety of tasks for a variety of clients. Work undertaken extended from a core business of installing drainage and under ground reticulation through to finishing works such as concrete foot paths and kerbing. Since the company’s inception in 1971 Campbell Contractors has grown in staffing numbers, resources and the scope and size of projects undertaken. Now run by Ron’s son Jason Campbell since the year 2000 the company has become an efficient, resourceful and proactive specialist contractor. Campbell Contractors has constantly expanded its business to provide the latest technology in drainage contracting and to also expand into becoming subdivision contractors providing excellent service in a constantly changing environment.